As Hurricane Sandy works its vicious way up the East Coast, widespread power outages are basically a given. Without a way to charge your gadgets, you'll want to conserve as much power as you can, especially your cell phone, as it may be your only means of communication during a massive storm. The display is one of the biggest sources of battery drain on any device, so dim the brightness on your phones, tablets, and/or laptops to stretch out their lifespans. If your power goes out, turn off Wi-Fi and Bluetooth on all your devices, otherwise your device will waste precious battery power searching for connections that aren't there. To further reduce power use on your smartphone, turn off cellular data completely and allow only for phone calls and text messages. On the iPhone, toggle the “Cellular Data” option under Settings > General > Cellular. On an Android phone, look for “data usage” or a “data enabled” option under Settings > Wireless and Network. 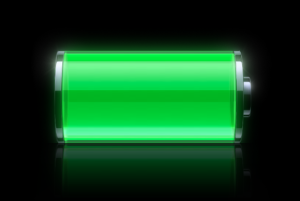 If all else fails, you can switch to airplane mode to maximize battery life without turning your phone off completely. This may be obvious, but avoid streaming video or tasks that need lots of data or processing power. Not only will they drain your battery, they can also increase network congestion. Minimize your phone calls, and use either text messages (which are more likely than voice calls to go through in times of congestion anyway) or social media to maintain contact and update friends and family of your status. Remember that you can use SMS to update your Facebook and Twitter accounts to let people know you're okay. Your unplugged laptop won't be too useful without an Internet connection anyway, so during an outage, its best purpose may be to top up your cell phone through its own battery. Plug in your phone via USB, and keep the laptop's screen dimmed or off, and you should be able to harvest some extra power. You can also recharge from a car if you have a car charger, but you'll need a well-ventilated place (not inside a garage) if you must run the car to charge gadgets, so, in that case, this is only a good idea after the storm winds down. A fully-charged computing device isn't worth much if it's fried, so basic precautions apply: Move your most important gadgets to higher ground (for example, don't keep them in your basement), or wrap them tightly in plastic (heavy-duty garbage bags work well). If you must leave your home, put your smaller electronics and their chargers in plastic bags to take with you. One severe drenching from Sandy, and your phone ior tablet could refuse to work. And if you evacuate, unplug all electronics. Unplug your gear during electrical storms, especially electronics without surge protectors. Now may be a little late to start backing up all your files, but if you've got anything that you'd be devastated without, throw the files on a thumb drive or, better yet, upload them to a cloud-storage service, such as SkyDrive, Dropbox, or Google Drive.